Create a beautiful autumnal still life with russet/gold/cardinal colored foliage, berries, flowers and seed heads from your garden. Pair a basket of like-colored apples and voila! instant arrangement. grow those colors and textures and hues in our landscapes that also enhance the decor and style and hues of our home's interior. Put another way, what looks good growing together in the garden will also be a beautiful ensemble inside our home and match our indoor color schemes when cut for the vase. Beautifully colored oak leaf hydrangea leaf, nandina berries, sprigs of sedum, and a late blooming apricot rose are part of the the equation. A small bouquet of spider mums in similar colors joins the assembly of garden cuttings. In my own gardens, this is not especially true.......until autumn. When fall arrives, the foliage of my oak leaf hydrangeas, deutzia, maples and on and on begin to take on the hues of the colors of my home: creams and russets and burnt umbers....dusty greens and apricot. Nandina berries are only halfway to the red they will assume in the winter.....the perfect shades of terra-cotta and orange I want in my seasonal arrangements now. Sedum flowers, poppy pods, papery dried hydrangea blooms add sumptuous textures and contrast to the boldly colored leaves. An umber pedestal vase accentuates the beauty of the garden cuttings. A pale pumpkin sits at its side. My kitchen turns into a happy playground, with leafy and flowery toys to entertain and delight me. I enjoy the fussing and placing and putzing. Execution is easy. A loaf of oasis is saturated and then placed in the container, secured with florist's tape and then assembled in a pleasing way....according to this artist's whims. Layer upon layer of leaves, flowers and berries are added. Knowing when to stop is the biggest challenge in its artistry. Flaming colors toned down by dusty creams and greens speaks the season....and the colors of my kitchen. From the front and from the back....different views and different textures. 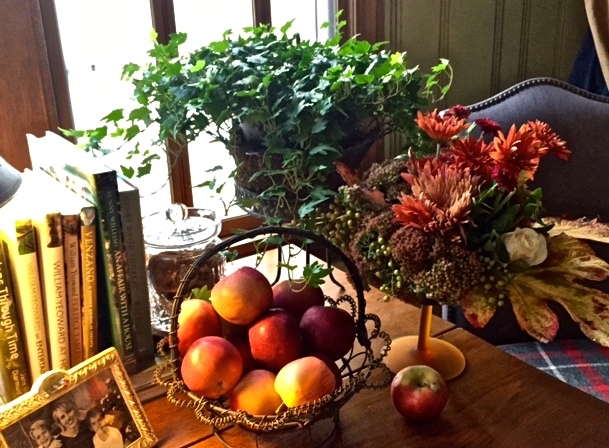 In my morning room with apples and plaid and ivy for company. Then put in place where I, and visitors can enjoy them...however fleetingly.